When you try to export animation in gif format you can see a white screen and most people think that Photoshop is stuck. First, don`t worry. Photoshop is not stuck. PS need a little bit time calculate each frame of your animation and write it in cache. What do you need to do? Just wait a little bit. That is all! Make sure you are using the English version of Photoshop. Each action has been created to work only with the English version of Photoshop. Use a image with resolution 72px/inch or more and in range from 2500-4500 px. If you are using a photo with less than 1000px, the action will not function correctly. To fix this, go to Image->Image Size and increase the resolution value. Before you play the action be sure that you have set your main image as default layer with name Background and lock. How convert your layer into default layer you can find in this FAQ. Plz, don`t ignore help file. Follow the instruction that described in the ReadMeFirst.pdf file. Follow the instruction and be happy. Also inside you will find a link on the video tutorial. This error occurs when Photoshop cannot find enough visible pixels to make a selection. This can happen in a few situations listed below. If the action requires brushes for it to work, please ensure your brush opacity is set to 100% before playing the action. You have brushed over your photo with a very faint brush. Please use a brush with 100% opacity when brushing onto your ‘brush’ layer. You have only brushed a very small area or very thin lines. Most of my actions use the area within the area that you brush to create effects out of – so it is important you create a large enough brushed area to avoid Photoshop running into selection errors. In some rare cases, the resolution of your document might be set to something very small like 20. Ensure your document is set to 72dpi or greater before playing the action. Still having troubles with an action? 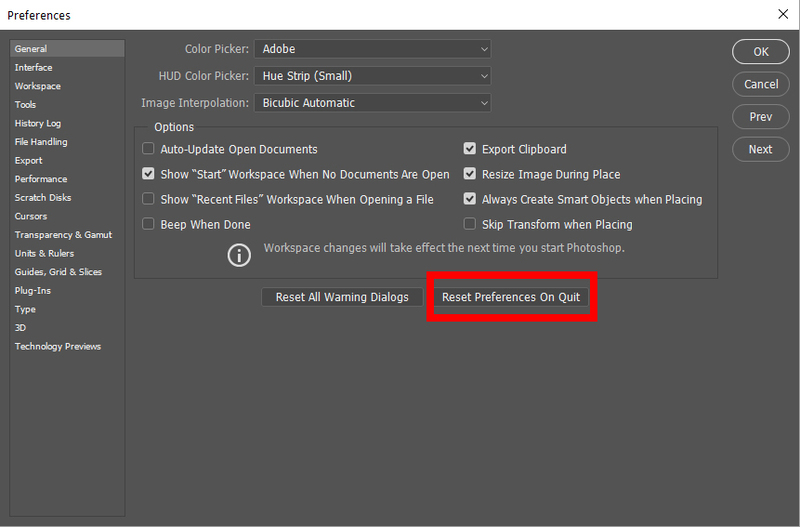 The common cause for errors in actions are corrupted Photoshop preference files. This can cause an action to throw unusual errors that prevent the action from completing. Most of the time you don’t even know they are affected. This is generally the case if you have not run a Photoshop action before, in a very long time or have upgraded to a newer version of Photoshop. Reset your preferences by going to the menu ‘Edit > Preferences > General’ and then selecting ‘Reset Preferences on Quit’. You need to set your photo as the background before running the action. You cannot simply name your layer Background and lock it. To set your photo as the background, select your photo layer and go to the menu Layer -> New -> Layer from Background. I demonstrate this at the beginning of each video tutorial for your reference. Important: you only need to do this step if you open up your photo and your background layer isn’t called ‘Background’ and has the lock symbol. In nearly all cases you only need to perform this step if the photo you open is a .PNG file, or any file with transparency. How to set the layer as background with lock? If you open image and you have a name ‘layer 0’. Select layer and go to Layer->New->Background from layer. Select your layer and click right button of your mouse. There will be a layer properties, click ‘Flatten image’ menu. That`s all. 1. Inside Photoshop, go to the ‘Edit’ menu and select ‘Presets-> Presets Manager‘. A window will now appear. 2. Inside the Presets window, click on the drop down menu and select ‘Patterns’. From here select ‘Load Patterns…’. Select the Pattern which came with the download. 3. The Patterns will now appear in the Brush panel. 1. Inside Photoshop, go to the ‘Window’ menu and select ‘Brush Presets’. A window will now appear to the right hand side. 2. Inside the Brush Presets window, click on the top right hand corner icon to reveal the drop down menu. From here select ‘Load Brushes…’. Select the Brush which came with the download. 3. The Brush will now appear in the Brush panel. 1. Inside Photoshop, go to the ‘Window’ menu and select ‘Actions’. A window will now appear to the right hand side. 2. Inside the Actions window, click on the top right hand corner icon to reveal the drop down menu. From here select ‘Load Actions…’. Select the action which came with the download. Have you a tutorial how to use IMAGEMOTION panel for photoshop? Of course. One part of the lessons available on Youtube channel and the second part is in addition to the extension. Where to copy a resource pack? Packs of lens flare and dust light you can copy in any place on your computer. Also you can add your own images. How to install Effelar Extension? Full installation instructions you will find in the archive which you downloaded with extension. How to install Imagemotion Extension? Find your extension folder, select the folder and press delete. You can not find solution in FAQ section. Send me a few screenshots of your problem. The better if you will show to me your Layer panel and where action is stopped. If all else fails, please send me your PSD file setup so I can investigate. Fill the form on Contact page and describe your problems. My email you can find in the help .PDF files on last page.